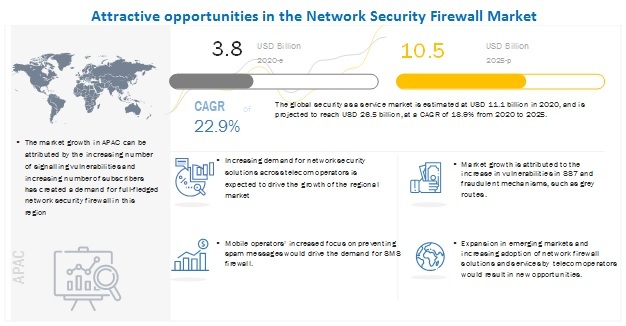 [157 Pages Report] The global network security firewall market size is expected to grow from USD 3.0 billion in 2018 to USD 5.3 billion by 2023, at a Compound Annual Growth Rate (CAGR) of 12.2%. The network security firewall market is segmented on the basis of component (solution and service), deployment, type, and region. The solution segment is bifurcated into signaling firewall and SMS firewall. The signaling firewall solution segment is further segmented into SS7, diameter firewall, and others. The SMS firewall solution segment is further categorized into A2P and P2A messaging solutions. The SMS firewall solution segment is expected to hold a larger market size during the forecast period, as increasing number of telecom organizations are adopting A2P messaging solutions. Additionally, SMS firewall solutions are used in network security firewall applications for the detection of malware over the operator’s network. The deployment type segment is categorized into cloud, on-premises, and network function virtualization (NFV). Additionally, enterprises are deploying their firewall solution virtually which is more secure as compared to on-premises and data becomes more assured. Professional services are offered by specialists and experts in network security to ensure secure business functions. Professional services comprise deployment and integration, support and maintenance, and consulting services for a network firewall. Moreover, the service providers evaluate the complete project life cycle and help with staffing and assignment of the right person for the right process. The professional service providers design tailored solutions for telecom operators to align with their business goals. The vendors offering these services use the latest techniques, security trends, and skills to ensure optimum security requirements of the telecom enterprise. These services help ensure that vendors deliver superior levels of service, and security so that the network can be secured. Vendors also offer risk assessment and assistance during deployment through industry-defined practices. Europe consists of many developed and developing countries such as the UK, Ireland, Sweden, Germany, France, and Italy, which have a broad subscriber base for telecom companies. The region has witnessed considerable growth in the adoption of smart technology in the past few years and has influenced growth of telecom services market. Enterprises, SMS aggregators, and mobile network operators in the region tend to modernize their A2P messaging solutions and recoup their revenue activities due to several cyber threats. The UK and Germany have always been on the top of the target list of attackers. The region is the home for major network security firewall solution providers, such as AdaptiveMobile, Cellusys, Sinch, BICS, SAP, and Orange. In 2018, the European Commission announced the creation of first ever Digital Europe Program and invest EUR 9.2 billion in advanced technologies during 2021–2027. 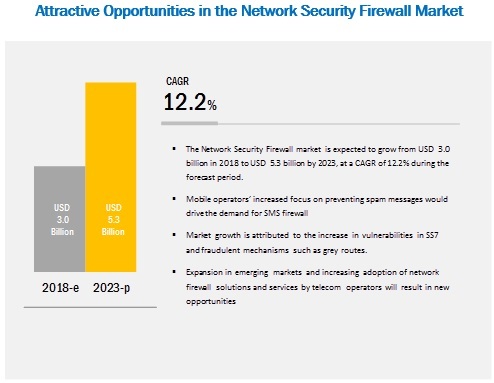 Major vendors in the network security firewall market include Sinch, Cellusys, Adaptive Mobile Security Limited (AdaptiveMobile), Mobileum Inc (Mobileum), Tata Communication Ltd (Tata Communications), AMD Telecom S.A. (AMD Telecom), and Openmind Networks. In October 2018, Mobileum acquired Evolved Intelligence, a global provider of analytics-based roaming and risk management solutions. The acquisition also serves to strengthen Mobileum’s presence in Europe. The existing Evolved Intelligence (EI) platform of Evolved Intelligence and architecture would be maintained and developed for further integration with the Mobileum Active Intelligence platform. In May 2018, Anam partnered with HGC to offer its industry-leading SMS Firewall and A2P Managed Services to Vietnamobile, which is one of the Hutchison Group networks. The joint initiative would generate increased A2P revenues and deliver improved customer satisfaction by addressing SMS Spam on the back of a secured SMS infrastructure. In April 2018, Orange International Carriers partnered with Anam to launch a new SMS product (SMS Protect), aimed at helping partners secure their network against frauds and bypass. This product covers multi-signaling carrier’s availability, domestic and international traffic, and SS7 and SMPP traffic. What are the upcoming industry solutions for the network security firewall market? Which are the major factors expected to drive the market? Which region would offer high growth for vendors in the market? Which solution would gain the largest market share in the network security firewall market? The study involved 4 major steps to estimate the current market size for the network security firewall market. The exhaustive secondary research was done to collect information on the market, the peer market, and the parent market. The next step was to validate these findings, assumptions, and sizing with industry experts across value chain through primary research. Both top-down and bottom-up approaches were employed to estimate the complete market size. Thereafter, market breakup and data triangulation were used to estimate the market size of segments and subsegments. In the secondary research process, various secondary sources such as D&B Hoovers, Bloomberg BusinessWeek, and Factiva have been referred to, for identifying and collecting information for this study. Secondary sources included annual reports, press releases, and investor presentations of companies; white papers, technology journals and certified publications; and articles from recognized authors, directories, and databases. The network security firewall market expenditures across regions, along with the geographic split in various segments have been considered to arrive at the overall market size. After arriving at the overall market size — using the market size estimation processes as explained above — the market was split into several segments and subsegments. To complete the overall market engineering process and arrive at the exact statistics of each market segment and subsegment, data triangulation and market breakup procedures were employed, wherever applicable. The data was triangulated by studying various factors and trends from both the demand and supply sides in the network security firewall industry. 1Core competencies of the companies have been captured in terms of their key developments and key strategies adopted by them to sustain their positions in the market. Sinch (Sweden), Cellusys (Ireland), Adaptive Mobile (Ireland), Mobileum (US), and Tata Communications (India). A total of 18 players covered. This research report categorizes the network security firewall market based on component (solutions and services), type (Packet Filtering, Stateful Packet Inspection, NGFW, UTM), deployment (on-premises, cloud, and NFV), and region.